Ok, confession time: Iâ€™m not into the whole organic/natural food thing, for two main reasons. 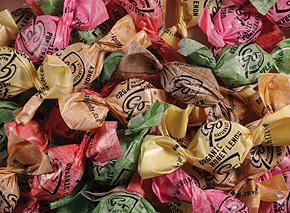 One, I donâ€™t believe in quick-fix solutions to the complex health, environmental and sociological issues that plague todayâ€™s food industry; and two, I just love my artificial flavors and colors too darn much. After all, the candy aisle would be a pretty boring place without them. Still, the idea of a candy thatâ€™s truly guilt-free (Iâ€™m talking eco-guilt, not calorie-guilt) remains a tempting one, even if itâ€™s just an illusion. So when I noticed a display of products from Shopperâ€™s Drug Martâ€™s new organic line, Nativa, it was naturally the candy that jumped out at me. 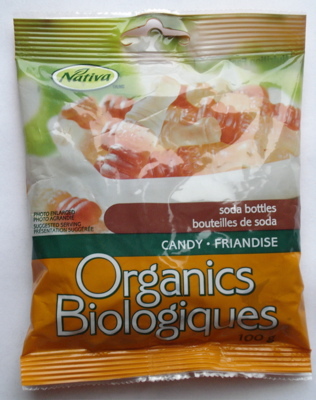 Though Nativa also makes organic gummy bears and fruit gummies with natural flavors and colors, it was the cola bottles (or â€œsoda bottles,â€ as theyâ€™re called on the bag) that grabbed me. Now, gummy cola bottles are among my all-time favorite candies, especially the sour variety. (Confession number two: I once ate an entire industrial-sized tub of sour cherry cola bottles from Costco â€“ AND Iâ€™D DO IT AGAIN.) So I was very curious as to how the organic variety would stack up to the real thing. At $2.99 for a 100 g bag, they were pricey (a common problem with organic foods), but I decided to give them a try. What did you say? A dark chocolate and bread candy bar? Yes, please. The other appealing aspect to this bar: itâ€™s certified organic and it’s Fair Trade. The first is better for your human body, the second for other human beings who farm and work in foreign countries. That’s great, and justifies a higher price, but a candy’s got to deliver the goods, right? This one does. A while back I attended the Fancy Food Show here in New York City. Like the All Candy Expo, the Fancy Food Show is only open to people in the food industry (or, in our case, members of the press who write about the food industry). Where the ACE is pretty darn big, the FFS is freaking ENORMOUS! From herbs and spices to olive oil to cheese to candy, pretty much every food group is represented to the extreme. I had the pleasure of meeting with the folks from Hillside Candy to try their GoNaturally Organic Hard Candies. Much to my chagrin, it’s taken me this long to finally find time to sit down and write a proper review of their tasty sweets. I got six different varieties of hard candy to try, including Honey Lemon, Apple, Honey, Cherry, Pomegranate, and Ginger. 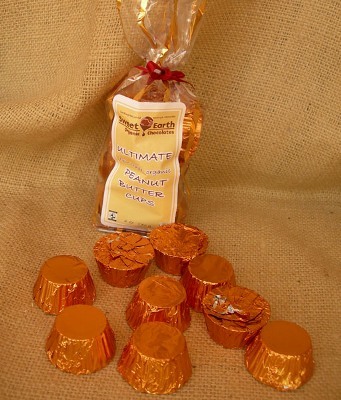 So how do these hand-made gluten free candies measure up? In my Candy Addict staff profile, I joke that I adhere to a strict organic, vegan diet to balance my rabid candy consumption. Though thatâ€™s not entirely true, if it were I could find sweet organic, vegan refuge in Zootons. What are Zootons, you ask? Well Zootons are beings hailing from Zootopia, of course! And they are here to save Earthling children and adults alike from bad candy. And how do they do that, you ask? Why, by generously sharing their homelandâ€™s chemical-free, fertilizer-free, gelatin-free, organic, vegan candy with â€œout of this world tasteâ€ of the same name. Naturally! And in the spirit of promoting healthy habits and practicing what they preach, Zootons also donate a percentage of their profits to Healthy Child, Healthy World, a non-profit organization campaigning for healthy environments for children. I was recently sent a box full of treats from Sweet Earth Chocolates, a California-based chocolate company that prides itself on selling organic, fair-trade treats. A portion of Sweet Earth’s profits go to support Project Hope and Fairness, a non-profit organization that supports cocoa farmers in Africa by promoting sustainability, agricultural education, and fair-trade practices. The package that Sweet Earth sent included this info, as well as beautifully wrapped chocolate bars, clusters, and peanut butter cups.